Week 17: A break! But a few odd things happen…….. 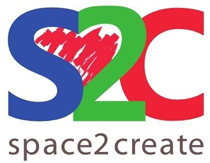 This week Space2Create took a short break after Easter so there were no sessions. Having said that the staff and volunteers still came in and had a big tidy up and sort out of resources on Tuesday. On Thursday they checked over the progress of the displays for the flower festival. We announced our new group too! Space2Create is very pleased to announce the start of DeafArt, Thursday May 1st. Session for Deaf and Signing participants only. The DeafArt sessions will be led by a very talented Deaf Artist, Ant, supported by signing volunteers. Session 10-12 every Thursday for 6 weeks, £2.00 with all materials and refreshments provided. See our website or email for more details. Deaf Centre, 5 Castle Street, Kendal. Spring had sprung today on the ward! To celebrate, participants enjoyed decorating their own plant pots and saucers using a range of techniques and styles, in both ordinary and pearlised acrylic paint. Floral, aboriginal and abstract design…s abounded, with one set of saucers notably sprouting polka dots. Some designs and their use of colour were both bold and striking; others more muted or subtle in their effects – but all reflected the participants’ enjoyment of the change of season, and the creativity which it inspires. Week 16: Something nearly every day! With our new groups up and running, some weeks there is some sort of Space2Create session running every day of the week. We have new things planned soon too. We will release more details about our Deaf Art group starting on May 1St soon and we look forward to many new exciting projects. In 2Create we continued with our themes from last week on surrealism. We also talked about creating depth in pictures using shading and perspective. Using pastels we tried a few practice shapes; shading, taking care to think of the light’s direction, and adding shadows. We then tried to create a larger scene using these ideas of shading and perspective to try and get away from flat-looking pictures. We had another great session with Ann The Poet, fun ways to create and produce great writing. Ann gave us different starting points and ideas to generate our writing. This week I managed to grab a few examples! Embedded in Mrs Nichols prize rose bush. A sea of crumpled plastic! And ran behind our very real hedge. He does the sound effects very well. His blue eyes do match Thomas’s paint job. Footprints in wet sand instead of tracks. Turn him round ready to go a new direction. He sneezes just the way trains don’t. The light bleeds in through the window and hurts my eyes. Between each tick and tock. I feel dry and cracked as a dirt road in summer. The Photo Group walked down along the river and then up to Kendal Castle. As usual there were plenty of interesting things to capture. The blossoms and daffodils looked great in the sunshine. We talked about dealing with bright sunshine whe…n taking pictures, and also a little about aperture and it’s effect on depth of field. One member had a plastic model knight and was attempting to take pictures such that it was larger than the castle behind it. In today’s session on the ward, we decided to enjoy some of the traditions of Easter: chocolate, eggs and rabbits!! This was a fun, creative session, where everyone just enjoyed a simple but rewarding activity. Rabbits, needle felting, flowers and cartoons were the main theme for today’s session. We decided to encourage individual skills, and every participant worked on different projects that they particularly enjoyed or wanted to develop. This a…llowed the session to be person-centred, with each participant producing unique work as well as developing their skills. Some photos were unfortunately lost in processing (for which, apologies), but the remainder show the outcomes of a very productive session. Week 15: Creative writing, felting fun, Journals, paint and eggs-just a typical week! In 2Create, we took some time to explore using acrylic paints a little more. We first produced a background using two colours roughly painted, then used a wet brush to blend and smooth the paint to our liking. As we have been looking at sur…realism recently we chose to place common objects in an unusual way. We looked at using a pale colour to roughly outline the image. Then we explored the idea of blending colours to produce graduated colours and using this to suggest light and dark, giving the images a slightly more realistic feel. We also discussed deciding on the source of light in our pictures to inform the shading and highlights. Given the wide range of abilities in the group we were pleased with the results. The first creative writing session was very well attended. Ann The Poet made it fun and relaxing and some great writing was produced. The main thing was everybody enjoyed themselves, there was a great creative atmosphere, lots of support between participants and lots of laughter. Great session. Next session 14th April 1-45 to 3-45. Everyone took their writing home so here is a quick one Mat wrote …in the session. We were given the starting line ‘I taught my hen to make soup’. And my wife ordered me to get a job! On the ward, we used a very basic bookbinding technique to create our own pamphlets. Participants found images, words and ideas by going through a range of magazines, books, guides and maps. These images and words were then glued or s…tamped onto paper which participants had folded and then bound using thread. Each booklet or notebook ended up with a theme unique to each individual, such as travel, flowers or mountains. Using simple techniques, various individuals achieved results which were useful or memorable to them. The session was easy-going but purposeful, and the results were both quirky and satisfying. We worked on a variety of projects in today’s session. The overriding theme was needle felting. We used dyed wool and a barbed felting needle to ‘agitate’ the wool and create felt animals, birds, fish and eggs. This technique is very access…ible and allows the activity to be achievable, and participants could be completely individual, making their own unique designs and creations. Some others in the session worked on finishing projects; creating rag flowers and vines for the Flower Festival, and a chair back that used ‘tatting’ to create the letters and edging. Still others worked on their own pieces: rag rugging, knitting and comic art. This was a vibrant and creative session, with a few new members, which was brilliant. Julia led today’s session, carrying on from a couple of weeks ago and eggs-tending the Easter-related creative fun. Some people carried on with eggs, adding to them and finishing off where they had been waiting for things to dry. Julia also introduced the idea of creating little creatures made from a collage of many different materials. Some great and creative ideas developed in the session. Week 14: Getting Surreal, aborigonal art, the birds and positive little boxes. Another very creative week at S2C. Things will be getting more creative next week with the start of our new group, Creative Writing. The group will be led by the fabulous Ann The Poet (Ann Wilson). Starts 7th April (Monday) 1-45 to 3-45 at the Gateway Centre in Kendal. Then the first block of seven sessions continues on April 14th, 28th. May 12th, 26th. June 2nd, 16th. In 2Create we looked at surrealism. We discussed how surreal art often used familiar things warped or distorted in unusual ways. We began to look at a simple way to start creating a surrealist image. We selected random photos from magazines… and arranged them together or apart. We then used a variety of media to link them together to create a surrealist image. This worked quite well and we ended up with some very surrealist scenes. Some tried to create a surreal image from scratch. In today’s session on the ward, our creativity was influenced by Aboriginal art. One of the session leaders had just come back from a trip to Australia, and she had brought with her many images and pictures of wonderful Aboriginal designs. …We looked at the way these patterns were made up, often using quite simple designs. We looked at the repetition of the patterns and aimed to try to recreate our own using a limited palette and with different media: paints, pastel, pens and pencil crayons. The session proved to be very therapeutic and relaxing, and at the end we discussed why we all felt the same way. We decided it was possibly the simplistic nature of the designs, the repetition, and not having to feel any pressure to create a picture that ‘looked like’ something. A very successful session. In today’s session a participant suggested the theme, which was brilliant. We used polystyrene eggs to form a base to felt wool on to, to make colourful eggs and birds. This proved a very satisfying technique, and after this, one participan…t created an entirely needle-felted robin. Another participant worked on their ‘cartoon-style’ art, a skill they are really developing well. As always by the end of the session, there had been many unique and inspired items created. In WellArt this week one of our volunteers took the plunge and led their first creative session for Space2Create. Dana began by asking everyone to write down positive words about themselves and Space2Create. She then had us making little bo…xes to hold our words. She had prepared individual goody bags each with a mixed range of media and items to use. When the boxes were decorated we also started making cards to go along with it. Dana’s idea was that when a person felt low, they could look at their box and the words inside to feel more positive. A great session, well done Dana.